Here is a film that respects its genre. 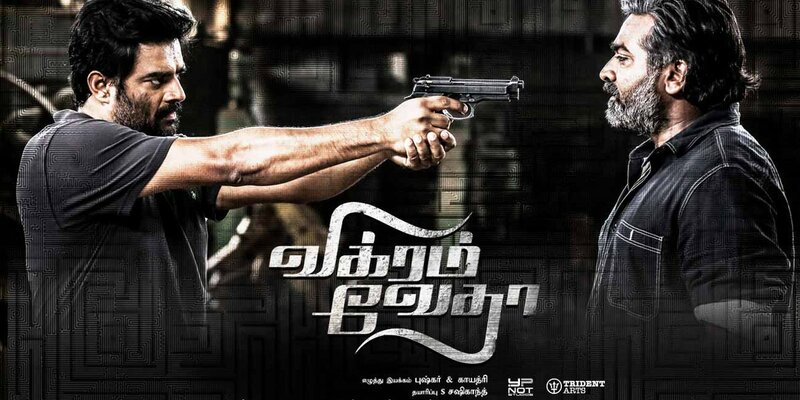 I don’t know where to start with about Vikram Vedha so I am just gonna say if you like Vijay Sethupathi and haven’t seen this movie, then you are in for a great cinematic treat. Haan, that way. Like John Doe in David Fincher’s Seven, Vedha himself walks into the police station when each every cop in the city was searching for him. The scene ends not before electrifying us like a Rajinikanth film. That was stunning. In another scene, Vedha asks Vikram to listen to a story before adjudging about what is evil and what is not. The film is filled with angry looking men. In that matter, Vikram Vedha is like Kuruthipunal for this decade. 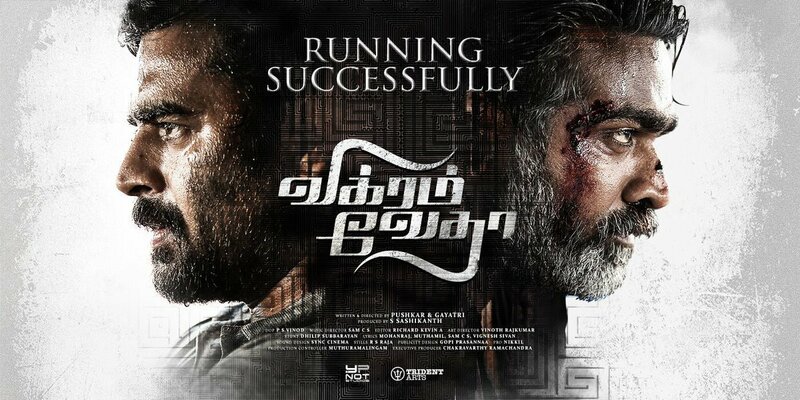 Even though it cannot replicate the intensity of Kuruthipunal, which will never happen, Vikram Vedha tells the same kind of crime story through a gripping-script with great success. Vedha’s first story is about how he rose to become a gang leader. At the end of this episode comes the first twist, and my favorite too. It is a cat and mouse game done at it’s finest. There are dogs also, but I wont say anything about the dogs. That is suspense. The story is developed well with the essential back-story. Through the stories of Vedha we come to know the whole life story of him. The screenplay succeeds in maintaining the grip throughout the show. Flash backs are cleverly used and my respect to the makers went high from that point. Superb Stuff. For friends who haven’t seen this smash hit yet, leave other non-sense, and watch this! Kathir, Shraddha Srinath, and Varalaxmi Sarathkumar, all the actors gave standout performances, particularly Vijay Sethupathi and Madhavan. Vikram and Vedha; everything goes through them. The beauty of these actors on screen is that they don’t know to over-act. They look perfect, always, and they can fit in different characters with ease unlike 99% of the actors from our industry. It will be a crime if Madhavan does not do more movies in Tamil. He was outstanding in a character which goes through various complex situations. Complex situations like… “Neenga shutup pannunga”, OK, complex spoilers… so “Naan shutup pannittean“. Madhavan and Vijay Sethupathi performances are like of Mohanlal’s or say Naaser’s. Everything looks so casual and so real. With each film Vijay Sethupathi is climbing the ladder to the status called the best Tamil actor. Soodhu Kavvum, Iraivi, Andavan Kattalai and Vikram Vedha. He can be funny, cruel, gangster, show anger, rage, and everything with no-nonsense gimmicks, with so much ease, with no getup change, with no changes from his real body language. We see Vedha and not Das from Soodhu Kavvum even though they look the same. That is exactly why I mentioned Mohanlal earlier. I should have mentioned Denzel Washington also. I forgot that. I’m yet to find one living creature who did not like this movie. No matter that the story has few holes but the appeal of this film is fishing amazing. What if I say Vikram Vedha is like Infernal Affairs! Do we have another gang-cop film in India which can keep close to Infernal Affairs? Everything from Pushkar-Gayatri’s direction to the dark beautiful violent story, to the electrifying soundtrack, is simply perfect. Well done Pushkar-Gayatri, in my wonderland I’d give you an Oscar.